The gyration frequency is important for two reasons: first, it must be higher than the plasma collision frequency: charges cannot afford to collide too frequently with other particles, otherwise their trajectories will not be guided and confined by the field lines of B, but will change randomly after each collision. Second, any reactor in which plasma is confined magnetically must host gyrating charges, so it must host field lines while particles gyrate around them with a radius p. This means that B intensity must be sufficiently large, both because gyration frequency is higher and because radius is smaller (the reactor becomes also smaller). In fact, using electrons as an example of charged species, and a field of 1 tesla (intense, but manageable) the gyration radius is not large, maybe of order 0.1 mm for electron kinetic velocities of order 106m/s. Repeating the same estimate for ions like H+, 1,840 times heavier than electrons, the same 1-tesla field could confine H + within a gyration radius of a few millimetres (for reference, 1 tesla in the International System of Units is equal to 10,000 gauss in the older Gauss system. At sea level the Earth's magnetic field is 0.3 gauss. So, 1 tesla is some 33,000 times more intense than the Earth's magnetic field). Permanent magnets can produce 1-tesla fields, but only within short distances; more rigorous treatment of this problem show fusion reactors using MCF may be made reasonably compact. 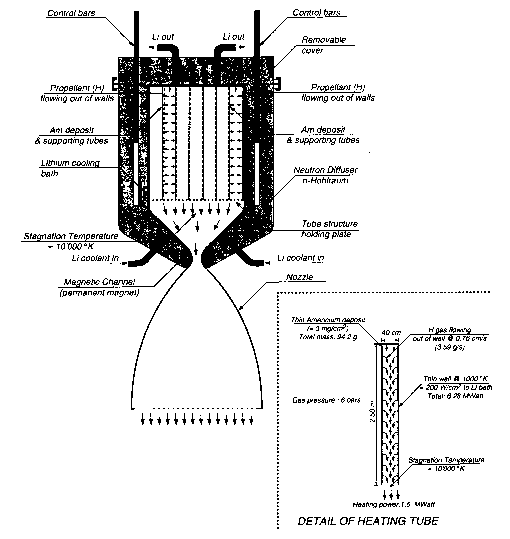 Note that the size of the reactor is also dictated by the mass flow-rate of plasma eventually ejected to produce thrust: plasma density and exhaust velocity, Ve, determine the cross-section, A, of the reactor. However, small gyration radii reduce the volume of plasma taken by spiraling charges. So, the more intense the B field, the more manageable the size of the MCF reactor: confining high-energy plasma depends to a large extent on creating intense magnetic fields. Magnetic MCF fields of order 1 to 10 tesla are feasible, but need large and heavy conventional electromagnets. In conventional electromagnets the field B is created by a current flowing inside copper wiring forming the magnet coil. Until so-called superconducting wires became commercially available, such B fields were prohibitively expensive if feasible. Current superconducting cables can carry currents of order 1,000 A/mm2 (about three orders of magnitude more intense than using copper) with practically no electric resistance at all, and thus no ohmic (power) losses. These cables are at the core of the giant magnets enabling particle accelerators and fusion ignition experiments worldwide. Much of superconducting technology is still based on so-called low-temperature superconductors (LTSC), made of materials such as Nb3S alloys, kept at temperatures of order 20 K by liquid helium. The LTSC wires in fusion tokamak are hosted inside stainless steel jackets, thermally insulated and drenched in flowing liquid helium. As an added precaution to avoid destructive damage, a thick copper sheath surrounds the insulation, carrying the high current normally carried by the superconducting wires should the LTSC material lose suddenly its superconducting properties. This type of construction means very expensive, very large and massive cables, all unsuitable for space applications. The realistic alternative is high-temperature superconducting (HTSC) materials, capable of staying superconducting at much higher temperatures (e.g., at the temperature of liquid nitrogen, 77.4K, rather than that of liquid He, about 4K. These new materials are more fragile than LTSC, but are far more practical and are already moving toward commercialization. They can carry almost the same current of LTSC, but clearly with less demanding cryogenic technology [Casali and Bruno, 2004]. With HTSC technology magnetic fields are practically limited only by the maximum intensity that the superconductor can tolerate before losing its SC properties: in fact, a peculiar property of superconductors is that they lose their capability when immersed in a sufficiently intense magnetic field. In practice, up to 10 to 15 tesla look feasible. A more recent MCF concept is the spheromak [Jarboe, 1994], see Figure 8.13, in which the magnetic field confining plasma is generated by the plasma currents themselves: no magnetic field coils link the torus, because, topologically speaking, the first wall of a spheromak is actually a "spheroid" surface, that is, a surface very much resembling a sphere. Because of the poloidal and toroidal fields being approximately of equal strength, the spheromak plasma creates its own torus inside its spheroid volume, with the torus axis coinciding with the spheroid axis of symmetry. The mechanism of plasma generation is that of the turbulent dynamo, similar, as far as is known, to the mechanism that creates the Earth magnetic field inside the Earth's molten and electrically conducting core. The magneto-hydro-dynamic regime of plasma in all MCF reactors is turbulent, so confinement efficiency and stable sustained fusion in a spheromak depends on plasma currents in a more sensitive way than in standard tokamak machines and, ultimately, is very sensitive to plasma instabilities driven by turbulence. The major interest and potential advantage of spheromaks is that they tend to be much more compact than typical MCF reactors.